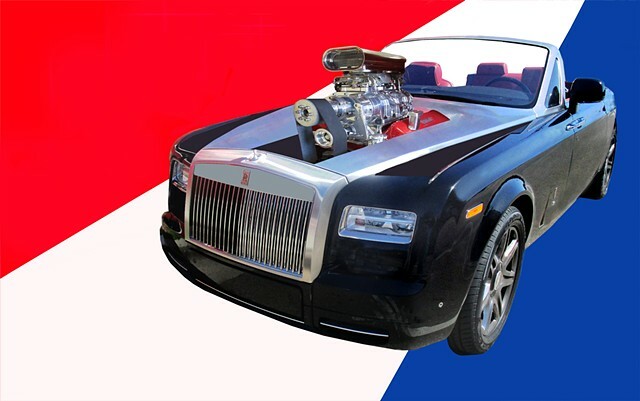 If I were wealthy, with deep pockets, this graphic designed mock-up 2016 Rolls Royce Phantom Convertible is what I would create for real. Most affluent folks are satisfied with having the standard 453-horse power V-12 motor it initially comes with. Similar to when my former boss in 1963 swapped a 1962 Ferrari 250 GTO V-12 with a high performance V-8 Hot Rod engine, this dreamy daily driver would be a hoot sporting around with a 2,200 HP high performance V-8. No real great match for all the unyielding pretentious super car owners out there that like to recklessly speed in traffic, especially those anxiously obsessed-smartphone-zombies that need to hurry up and get to a signal or stop sign to check their disconcerning communications. Ref: rvmann.com/artwork/3563418-Hand-held-Di?